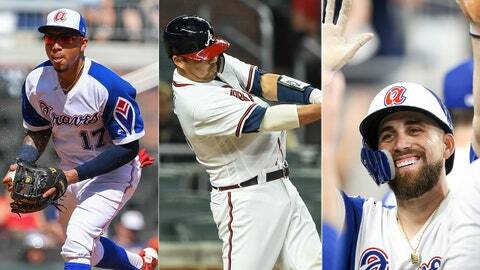 Three Cuts: Where will Braves’ focus be as trade deadline draws closer? ATLANTA -- While they haven't been dominant, in the midst of a 12-game stretch against sub .500 teams, the good news is the Braves have done enough to maintain their cushion in the National League East. They'll get three more shots at a last-place team when the Reds come to Atlanta for three games starting Monday as the Braves try to build on a 14-10 record vs. opponents with a losing record. The road, quite literally, is about to get rockier as the Braves' schedule heats up with the Cardinals, who are tied for the second-most home wins in the NL (21), along with the Yankees, holders of MLB's best winning percentage (.667) and the NL Central-leading Brewers. As we close in on the end of June questions abound for the Braves, most notably in just how active this team will be heading toward the trade deadline. 1. With little over a month until trade deadline, what is Braves' biggest area of need? Third base. Starting rotation. Bullpen. The Braves' areas of need as one of baseball's biggest surprises eyes a return to the postseason appear to be defined, but do recent injuries -- including one lingering one at Triple-A -- and recent performance impact how aggressive general manager Alex Anthopoulos will be in addressing them before the July 31 non-waiver trade deadline? As far as the starters, rookie Mike Soroka went on the disabled list Friday for the second time in a month with inflammation in his pitching shoulder, and meanwhile, Julio Teheran was tagged for a season-high seven earned runs by the Orioles and Anibal Sanchez allowed four runs in five innings agaainst the Blue Jays. Closer Arodys Vizcaino went on the DL with a sore right shoulder, and the past two weeks, four relievers have ERAs over 6.75. Vizcaino is expected to be back when his 1-day stint -- which is retroactive to June 21 -- ends. Atlanta has options in A.J. Minter (3.30 ERA, 2.60 FIP and two saves) and Dan Winkler (2.73 ERA and 1.45 FIP), who blew a save opportunity on Friday, but getting up-close looks at the Padres' Brad Hand, Kirby Yates, Craig Stammen and Adam Cimber or the Orioles' Brad Brach, Zach Britton and Darren O'Day -- some of the top relievers that could be had on the market -- could pique the Braves' interest. Hand is in the first year of a $19.75 million deal, and Cimber, a rookie, has tons of club control. Stammen, with two years left is an attractive, as are Branch and Britton are both in the last year's of their deal, while O'Day is due $9 million in 2019. Then there's the hot corner, where Johan Camargo has been solid, but a market that includes two players whose teams Atlanta faced in the past week in Baltimore's Manny Machado and Blue Jays' Josh Donaldson -- as well as the Royals' Mike Moustakas may be hard to ignore. Add in the uncertainty with Austin Riley, who has been sidelined since June 3 with a sprained right posterior cruciate ligament, and things get more interesting. 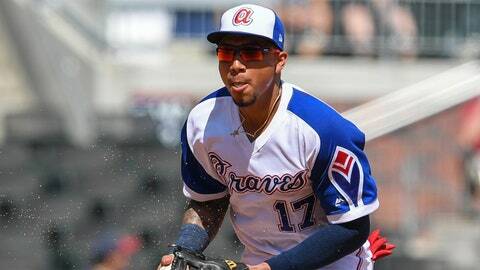 The 21-year-old is expected to return to Triple-A Gwinnett's lineup in about two weeks, creating a tight window if the Braves think they can get Riley back to the form that's resulted in 10 home runs across 53 games across two levels. It's worth noting that despite Vizcaino's shoulder issues, the Braves weren't interested in getting into the mix for Kelvin Herrera, who ended up with the rival Nationals. Given the talent Atlanta already has in the bullpen and Anthopoulos' statements from back at Winter Meetings that he's more than comfortable moving high-end starting prospects (think Kolby Allard or Luis Gohara when he returns) through the bullpen, like he did with Aaron Sanchez and Marcus Stroman in Toronto. The Braves could seek to supplement its position at third beyond Camargo and Charlie Culberson. Camargo, who struggled against right-handed pitching last season is now at 28 percenta bove league average to go along with a 98 wRC+ vs. lefties, all while sitting on a 3.2 defensive WAR. Over the last 30 days, Camargo's 121 wRC+ is seventh-best among National League third basemen. It's not necessarily cornerstone of the future production, but it's also not blow-your-prosepct-capital on a replacement, bad. Despite the depth of starting pitching, with the Braves understandably being cautious with Soroka and the erratic play of Teheran, entering a starting pitching market may be the most logical move. Toronto's J.A. Happ, a free-agent-to-be just went 8 1/3 in a 5-4 win over Atlanta last week, has to be on that short list, along with the Rays' Chris Archer (under club control though '21) and the Rangers' Cole Hamels . And if Anthopoulos wants to go big, there's always the Mets' Jacob deGrom ... though the price tag there could be ghastly. With Anthopoulos' gunslinger reputation, the first-year GM could make a seismic deal like Jon Morosi tossed out last week on MLB Network Radio for Hamels and Texas third baseman Adrian Beltre. 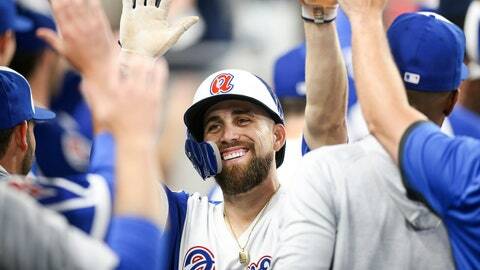 But with the Braves being patient while building the future, there remains the chance that any deal isn't as earth-shattering as the kind Anthopoulos swing in Toronto (think the Troy Tulowitzki and David Price trades). The NL East window opened sooner than the Braves could have anticipated. Maybe proceeding with caution is the right play. The latest All-Star Game voting update shows Kurt Suzuki sitting third among NL catchers with 557,692 votes. That's 128,561 behind the position's leader, the Giants' Buster Posey, and he trails the Cubs' Wilson Contreras by 38,419. Chances are, as much of an impact as Braves Country is having on the Midsummer Classic's vote -- currently, Atlanta leads at three positions with Freddie Freeman at first base, Ozzie Albies at second and Nick Markakis in the outfield -- Suzuki faces a major climb to earn his second career All-Star nod and the first since 2014. Yes, you can chalk his place in the balloting to Braves fans coming out in full force. The fan base is without question making a major impact, but don't let Suzuki's support be clouded by that A on his hat. The All-Star vote is placing the spotlight on MLB's top part-time catcher, who is putting together the best first half of his 12-year career. Hitting .282/.340/.486 with eight home runs, 12 doubles and 26 RBI in 197 plate appearances over 53 games, only five catchers have a better WAR than Suzuki's with a minimum of 190 PAs, four of whom are in the NL (the Marlins' J.T. Realmuto, the Pirates' Francisco Cerevelli, Contreras and Posey) and Suzuki has the third-best wRC+ at 123. Suzuki's best first-half came -- as no surprise -- in his All-Star season when he was sitting on 116 wRC+ at the break, and he's currently 15 percent higher than he was as year ago (108) when he and Tyler Flowers combined to give the Braves the most valuable catchers in the game at 5.1 WAR. They're at it again, ranking fifth at the position (2.1) and the past two seasons, only five catchers have been more valuable than Suzuki's 3.9 WAR. The word is out, and the fans' support is putting the rest of baseball on notice. There's no tip-toeing around the fact that Ender Inciarte's stat line has been a drop off from his All-Star campaign of 2017 when he entered the next-to-the-last weekend of June hitting .308/.356/.410 -- but amid a sometimes frustrating first half, Inciarte is showing signs that he's heating up and it has him back atop the order. 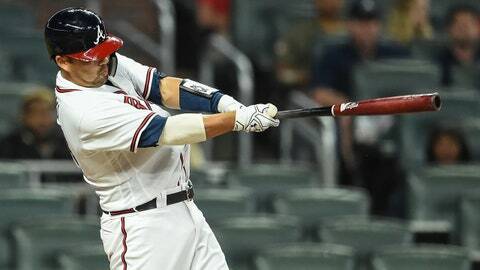 Slashing .252/.313/.352 after Sunday, since the start of the two-game series against the Mets on June 12, Inciarte is 14 for 43 with three doubles, a home run, two stolen bases and a .395 OBP to go with .326 average and .465 slugging. It was enough for Snitker to move Inciarte back to leadoff for the Orioles series and he responded by reaching base seven times in the series, going ? over the three game-set. The move could have been seen as a temporary one as Ronald Acuña Jr. is rehabbing with Gwinnett, and there's the possibility that he eventually climbs back to second in the batting order, with Ozzie Albies back at leadoff. However, Snitker did say Friday that would like to keep the center fielder atop the order, and reiterated Sunday, saying "I personally think we're at our best if he's leading off and he's doing what he's capable of doing. He made some adjustments in Toronto and he's looked good." To the credit of the manager, the change helped ignite a slumping Albies. Hitting .190 with a .230 on-base percentage in the previous 14 games -- 13 of which he in the leadoff spot -- the second baseman was 9 for 15 against Baltimore, including four hits on Saturday and three Sunday. It's been a slow climb back for Inciarte this season. His OBP was as low as .299 OBP on May 8 and since then he's largely hit sixth (19 games) and seventh (nine) before finally returning to the spot in the order he filled for 154 games last season and the first 25 games of '18. The timing couldn't be better, as over the last two weeks, only 16 NL players have a better OBP than Inciarte's .404 -- and it may be setting the stage for another second-half surge. While he did hit just one percent below league average last season (99 wRC+), that's not the norm for the centerfielder. This season is, though, as Inciarte's at 84 wRC+ this season, in line with the first halves of his first three years. In those previous campaigns, the centerfielder always improved in the second half, averaging 113 after the break, including 101 last season. Follow Cory McCartney on Twitter @coryjmccartney and Facebook. His books, 'Tales from the Atlanta Braves Dugout: A Collection of the Greatest Braves Stories Ever Told,' and 'The Heisman Trophy: The Story of an American Icon and Its Winners.' are now available.